Watch Michael Franti encourage everyone to hug someone every day and honor His Holiness Dalai Lama at his 80th Birthday Celebration on July 5, 2015, with a crowd of 19,000+ at this Global Compassion Summit. One of the most energizing parts of His Holiness 14th Dalai Lama 80th Birthday Celebration yesterday was musical performances by American rapper, musician, poet, and singer-songwriter Michael Franti in front of a crowd of 19,000 at the Honda Center in Anaheim, California. Celebrity birthday wishes were also given by Emmy Award Winner Julia Ormond, MC Hammer, Comedian George Lopez, Wilmer Valderrama (“That 70s Show”), Randy Jackson (“American Idol”) and via video. 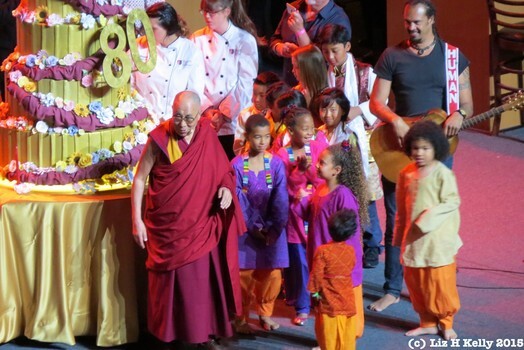 After three hours of birthday wishes from celebrities, social good leaders, and performers, plus a 15-minute talk about compassion by His Holiness Dalai Lama, the audience was excited to stand up, cheer and clap when Michael Franti took the stage. When Michael sang “Rise Up!”, he encouraged everyone to hug someone every day. Everyone then rose to their feet singing with Michael, “We all will rise up!” to honor His Holiness Dalai Lama. After a BIG Birthday cake with 80 on it presented by a childrens’ choir and Michael Franti, there was a Q&A session facilitated by the host Ann Curry (“Today”) with the stars on stage. When Ann Curry asked the Dalai Lama how he handled criticism, there was a priceless moment where HH laughed about someone calling him a “demon”. His Holiness Dalai Lama then advised everyone to just let it go and keep calm if someone critcizes you. He then reflected, “Like ocean, on the surface, wave always there, but underneath, always calm.” You can watch more in our VIDEO: Dalai Lama explains how to handle criticism at 80th Birthday Party. During this Q&A part of the event, Julia Ormond praised His Holiness as someone who could be a great actor. She expanded that “acting is about being,” and the Dalai Lama is “the best person for being in the present.” Julia also thanked His Holiness Dalai Lama for being empathetic, practicing compassion and bringing out the best in us. You can watch this exchange in our VIDEO: Actress Julia Ormond praises Dalai Lama at 80th Birthday Celebration. Many thanks to the Friends of the Dalai Lama, UC Irvine and the Center for Living Peace for hosting this 80th Birthday Celebration for His Holiness Dalai Lama. This event was part of a 3-day Global Compassion Summit. You can find out more and follow the conversation on social media with the hashtags #WithCompassion and #HHDL80. Namaste.